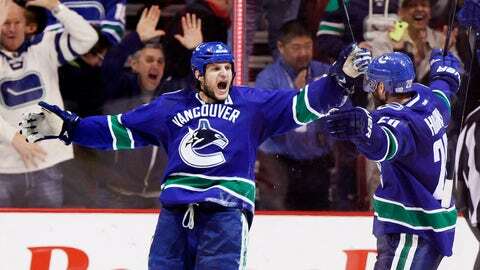 Vancouver's Kevin Bieksa, left, celebrates his game-winning, overtime goal against the Coyotes. VANCOUVER, British Columbia — The Vancouver Canucks came through in a game full of deflections and bounces. Kevin Bieksa scored his second of the night at 2:15 of overtime as the Canucks came back after twice giving up two-goal leads in a 5-4 win over the Phoenix Coyotes. Bieksa picked up his own rebound and chipped his fourth of the season over Phoenix goalie Mike Smith while falling to the ice. It capped a game where Coyotes forward Antoine Vermette was credited with a hat trick – even though he only shot one puck into Vancouver’s net himself. Chris Higgins had a goal and two assists for Vancouver, while Zac Dalpe added a goal and an assist. Jannik Hansen also scored for the Canucks, his first in 11 games. Vancouver came in having scored just eight times in its previous seven games. ”It wasn’t your typical game. We’ve been struggling to score goals lately, so let’s take some positive out of it. We put five in, some guys got on the score sheet and we found a way to win when it came down to it,” said Bieksa, who also had an assist. Roberto Luongo, who was shaky at times and even directed one of Vermette’s goals over the line himself, made 29 saves for the Canucks. Shane Doan chipped in with a goal and an assist for Phoenix, which got 20 stops from Smith. After a wild finish to the second period, Doan tied the score 4-4 on a breakaway at 5:24 of the third for his 15th of the season. Vancouver was handed a power play right at the end of regulation, but the league’s 28th-ranked unit failed to convert in overtime before Bieksa won it. The Canucks’ power play came in 2 for 30 over the last eight games and rarely looked dangerous against the Coyotes in four failed attempts. ”When a power play struggles it can take on a life of its own,” said Sullivan, who is running the Canucks’ bench in place of the suspended John Tortorella. Down 2-1 in the second, the Coyotes tied it while short-handed against the Canucks’ feeble power play. Vancouver forward Ryan Kesler tried to slap the puck off Vermette’s stick in front of Luongo, only to see it carom into the net to tie the score at 9:07. The goal was Vermette’s second of the night and 17th of the season. The Canucks had just 10 shots in total when Higgins restored Vancouver’s lead at even strength by deflecting a shot from the point past Smith for his 14th of the season, and second in two games with 3:01 remaining. Dalpe then followed up his own rebound off the rush to score his third and stretch the Canucks’ lead to 4-2 just 42 seconds later. That two-goal lead was short-lived as Vermette completed his second hat trick of the season – and third of his career – with 54.5 seconds remaining in the period as the Coyotes broke through against the Canucks’ stingy penalty kill, which came in ranked second overall. Vermette now has six goals in his last six games, and three short-handed goals in his last four. The Canucks, still without injured forwards Henrik Sedin and Mike Santorelli because of upper-body injuries, beat Smith twice in a 44-second span midway through first period. Bieksa opened the scoring at 10:31 on a shot through traffic to pick up his first goal in nine games. Hansen then doubled the Canucks’ lead at 11:15, ripping a shot through the goalie’s legs on a 3-on-2 rush for his ninth of the season and first point in nine games. Phoenix cut the lead in half just 18 seconds later thanks when Luongo inadvertently directed a loose puck off the stick of Vermette into his own net. NOTES: Henrik Sedin missed his third straight game, while Santorelli sat out for the fourth consecutive game. . . . Canucks F David Booth sat out as a healthy scratch with Vancouver electing to dress seven defenseman. Yannick Weber took some shifts as a forward, but played primarily on the first power-play unit.